Getting a new paint job can be one of the most beneficial classic car restoration services. 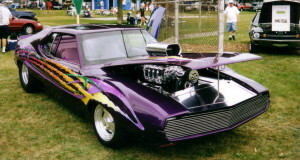 Classic car restoration services can use new paint to make your restoration look vibrant, colorful, and as good as new. However, there are several options to consider when you want to touch up or completely restore your vintage car’s paint job. Here are some of the things you need to think about before buying paint, primer, or even full paint jobs from classic car restoration services. Repainting an entire car – classic or modern – can be costly. Thankfully, it is sometimes possible to salvage the paint job on your classic car and retain the original color. When old cars sit out for years in junk yards or spend decades without proper maintenance, their outer layers of paint can easily corrode. Ultraviolet rays, dust, salt, and acidic rain can wreak havoc on paint jobs. If your car has large patches of rust or corrosion, it will probably need several new coatings of primer, paint, and gloss. If there are just a few blemishes, however, you can see dramatic improvements by simply removing the outer layer of paint. As long as the original paint job was several layers thick, stripping away the damaged layer can reveal deep, vibrant color. It can sometimes be difficult to find the right paint for your car. Older automobiles were often sold in colors that are no longer popular, so hobbyists who want to reproduce an authentic look will need to search for specialty paints. Classic car restoration services often carry vintage colors and offer options for mixing paints to achieve a specific appearance. If you’re going to repaint your car yourself, you need to put a great deal of time and effort into the prep work. Begin by using a power-sander to thoroughly smooth your car’s body and remove blemishes. This is a time-consuming process, but it is absolutely crucial for a quality paint job. Once your car is smooth, thoroughly wash and dry it, using an air compressor to remove excess moisture, dirt, and particles left over from the sanding process. Finish the prep job by taping and covering every surface you don’t want painted. You first need to choose the most optimal environment possible for completing your paint job. Indoors is ideal, and perfect weather is a must if you’re going to paint outside. Dirt and insects can easily make their way onto your primer and paint once applied, leaving unsightly marks. Before you apply any color, you’ll need to put on two coats of primer. Once your primer is dry, remove most of it by yet again sanding your car. This will leave a smooth, paint-friendly surface and fill in any gaps in car body. When you’re ready to paint, you’ll need to either apply several thick coats, or use one coat followed by a protective gloss. In either case, you must constantly make sure the prior coats of paint or primer are completely dry and free of blemishes before you continue with the next. Many hobbyists enjoy doing their own paint jobs, but it requires a great deal of time, money, know-how, and specialized equipment. Unless you own an auto shop yourself, it may be better to hire classic car restoration services to professionally apply a beautiful new paint job to your car. Professional classic car restoration services can use blasting techniques like sand blasting to strip a car of its paint and finish, but even this doesn’t always work for some cars. For a comprehensive classic car paint restoration project, dipping the frame and body components in an acid wash to completely remove all seals, gaskets, paints, solvents, oils and dirt is often the best option. To find out what service is right for your antique automobile restoration project, please call a professional for a free quote now.